Teleoperation and virtual reality systems benefit from force sensory substitution when kinesthetic force feedback devices are infeasible due to stability or workspace limitations. We compared the performance of sensory substitution when it is provided through a cutaneous method (skin deformation feedback) and a kinesthetic method (hand-grounded force feedback). For skin deformation feedback, we used a new force-controlled tactile sensory substitution device with the ability to provide tangential and normal force directly to the finger pad. 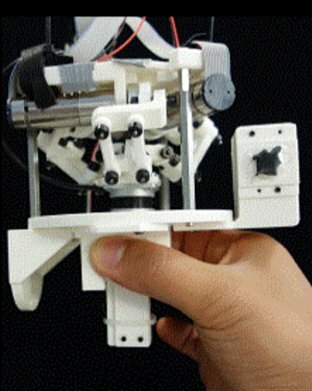 3-axis force control with 15 Hz bandwidth was achieved using a delta mechanism and 3-axis force sensor. For hand-grounded force feedback, forces were grounded against the palm. As a control, world-grounded force feedback was provided using a 3-degree-of-freedom kinesthetic force feedback device. Study participants were able to match a reference world-grounded force better with hand-grounded kinesthetic force feedback than with skin deformation feedback. Participants were also able to apply more accurate and precise forces with hand-grounded kinesthetic force feedback than with skin deformation feedback. Conversely, skin deformation feedback resulted in lowest error during initial force adjustment. These experiments demonstrate relative advantages and disadvantages of skin deformation and hand-grounded kinesthetic force feedback for force sensory substitution.